US demand for oil and gas infrastructure equipment is forecast to rise 6.3 percent annually through 2016 to $12.1 billion. The dominant pipe segment will benefit from construction of new transmission lines and the need for gathering systems at new drilling sites. Compressors will grow the fastest. The Eastern US will post the strongest regional gains. 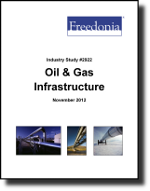 This study analyzes the US oil and gas infrastructure equipment industry, with forecasts to 2016 and 2021 by product (e.g., pipe, valves, compressors, pumps, gas processing equipment, monitoring equipment, storage tanks), market (oil, natural gas, onshore, offshore) and US region. The study also considers market environment factors, details industry structure, evaluates company market share and profiles 52 industry players such as Tenaris, US Steel, and Cameron.